Considered by many to be one of the top wedding spots in the entire Northeast, Castle Hill Inn sits perched atop a peninsula overlooking Newport Harbor and the Atlantic Ocean. The facility is the perfect backdrop for your reception and offers an outdoor wedding "chapel" where you can say "I do" just steps from the waves pounding on the rocks below! Newport RI might just be the perfect destination wedding venue on the east coast. Besides Newport's inherent natural beauty and expansive coastline, its backdrop of storied mansions with sweeping lawns down to the water's edge, beautiful beaches, and water views from just about everywhere make it an ideal location for a dream wedding. When you consider all that Newport has to offer, it makes this seaside enclave the perfect place for a destination wedding for you and all of your guests. Whether you are incorporating fun activities for your guests like mansion visits, harbor tours, trips to local vineyards or maybe even an authentic clambake on the beach, the list of exciting activities is endless. 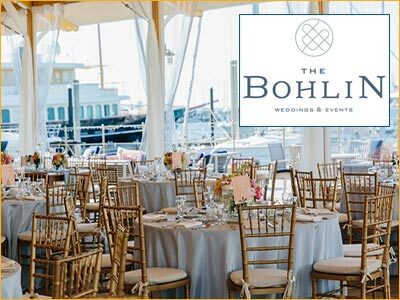 It makes planning the perfect wedding easy knowing that your guests can participate in these events or simply choose to tour Newport's historical buildings, dine at over 100 restaurants and explore Newport's unique blend of stores and shops. 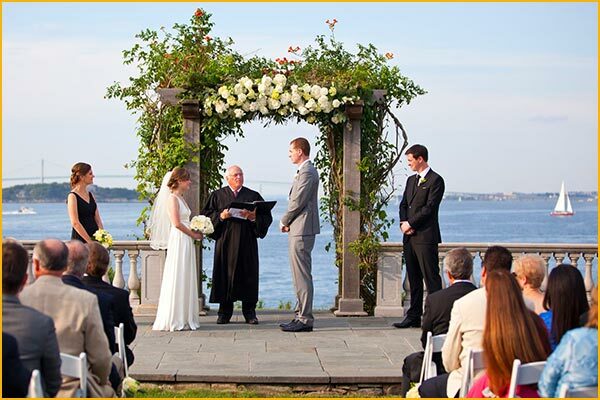 Still, choosing the right place to get married in Newport RI can be a daunting task with so many options available- from small intimate restaurants and hotels to large function halls and facilities specifically built for weddings and large functions. Unlike many other wedding destinations, Newport's smaller establishments make themselves available for wedding functions such as rehearsal dinners, receptions and even to hold the actual ceremony. The venue you eventually choose will be largely determined by both your budget and your guest list, so try to get these numbers in check before you start searching. Also, try to determine whether you are looking for a smaller intimate location, or perhaps a fairy tale wedding right on the beach or on the lawn of one of Newport's famous mansions. 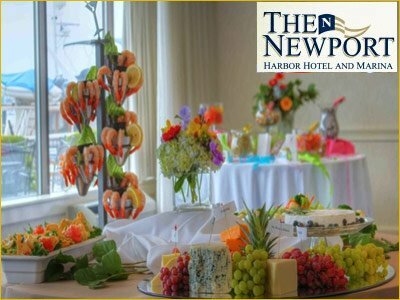 Newport's many catering companies can be mobilized to serve your guests just about anywhere, which can make the location of any of your wedding events truly special and unique. There are dozens of different wedding venues in Newport RI, from small hotel courtyards to venues built specifically for weddings and events. Amongst all these venues, there are also plenty of historic buildings and locations for your wedding reception, including Fort Adams, The Eisenhower House, several vineyards and even the Tennis Hall of Fame. If you're willing to go a little further outside of Newport, even more options are available in nearby Middletown, Narragansett, Tiverton and Bristol. Just use your taste as a guide, and explore as many options as possible as early as you can. Prime dates on Saturdays in the summer months are the first to go, with Fridays and Sundays a close second. Newport is absolutely beautiful in September in October, and with temperatures in the 60's and 70's most days, makes the perfect backdrop for a dream wedding. Cooler days means your guests and wedding party are more comfortable, yet you can still experience all the things that make Newport great - warm ocean waters, sailing, fine dining and nightlife along Newport's wharves. The season really doesn't end on Labor Day as it does in many New England coastal communities, and many of the outside shops and dining are open through mid-October if weather permits. To help with your wedding venue budget, try to use the same vendor for as many things as possible. This can make your planning a lot easier and also drive down costs for your Newport wedding. A lot of wedding venues in Newport have existing relationships with caterers and florists, and even event planners to help make decisions and plan the perfect day. There are hundreds of weddings held in Newport each year, and these experts can really help you navigate the countless choices before you. Either way, there truly is something for everyone's dream destination wedding in Newport, whether you want to fly high in a helicopter to start your new married life or just enjoy an intimate ceremony with family in a private courtyard. The choice is yours and the options are endless! NEW! Say “I do” overlooking Newport's famous harbor. Celebrate in the midst of majestic sailboats and watch the sun set over the iconic Newport Bridge. This waterfront setting offers soft Atlantic breezes, unsurpassed harbor views, and comfortable, casual elegance. Enjoy the intimacy of our private seaside retreat just steps from all that downtown Newport has to offer. For city, harbor and bridge views, this location can't be surpassed. 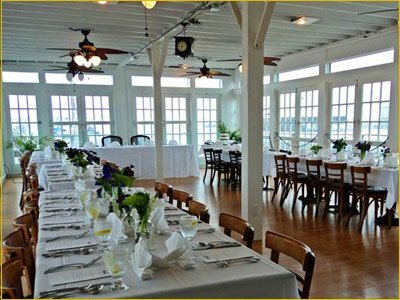 Its sits on the tip of Goat Island, just a few hundred yards from downtown Newport, and offers a traditional setting for your reception and rehearsal dinner. 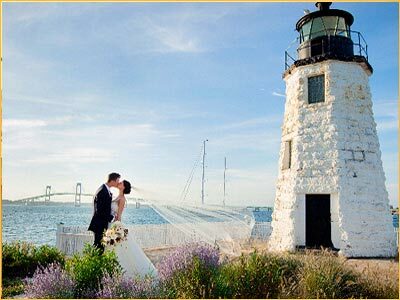 Just imagine your wedding day on a resort-style island featuring a quaint historic working lighthouse and The Newport Bridge over sparkling waters as the scenic backdrop for your ceremony and reception. 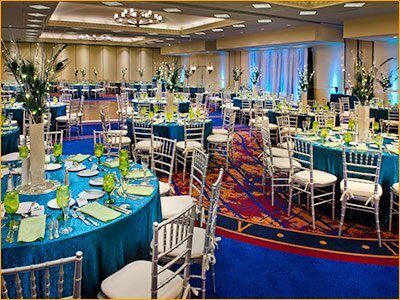 A variety of indoor and outdoor venues are available for your rehearsal dinner, ceremony and reception. A $34 million renovation has enhanced all aspects of the resort, making it an easy choice for couples who want a single location for all the festivities. 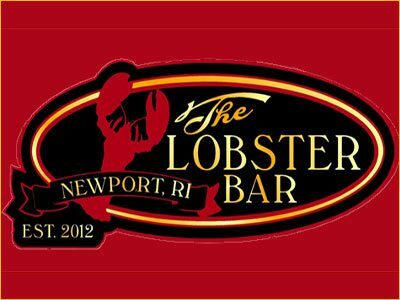 If you're looking for a more relaxed environment for your wedding but still want all the charm of Newport, this is the place for you. A wall of french doors is the only thing separating you and your guests from Newport Harbor and its beautiful sunsets. Because of its layout and size, The Landing can accommodate both small and large weddings with ease, and can make for a fun and unforgettable day! This new restaurant and bar located right on a working wharf gives 180 degree views of Newport Harbor and features nothing but fresh local seafood. 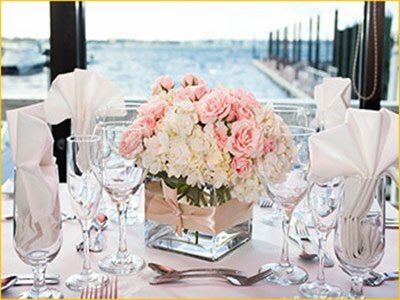 Featuring a fresh lobster tank and amazing views of Newport Harbor, this cozy authentic waterfront New England restaurant is the perfect choice for rehearsal dinners, intimate wedding receptions and other special events. Midtown Oyster Bar sits right at the main intersection of Thames Street and Memorial Boulevard, and offers water views from its harbor-facing deck. 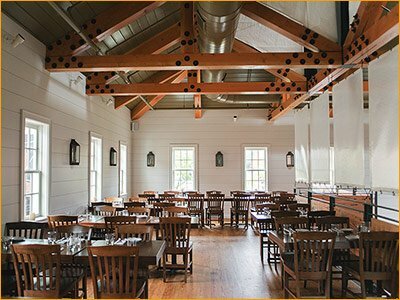 Although its brand new, it is rich in colonial charm and character, the perfect place for a rehearsal dinner or wedding reception. With massive vaulted ceilings and cozy dining areas, Midtown can easily accommodate groups of many sizes comfortably. Looking for the perfect place for your rehearsal dinner or perhaps a brunch the day after? The Newport - Harbor Hotel & Marina offers coastal-inspired cuisine, a full lounge & bar, outside function lawn at the marina and even direct access to sailing adventures for your guests on real America's Cup Racing Yachts. With 133 guest rooms, its the ideal location for your guests to stay in Newport throughout the festivities. Perfect... that is what your wedding should be. We’ve invested over $35 million in a makeover for our elegant waterfront hotel to make sure your special day is just that. We offer a single venue for all of your wedding events. Enjoy harbor access for stunning photos. Experience newly appointed spacious bridal suites and nautically-inspired guest rooms. Get ready in our full-service on-site spa. Gather with guests in our new greatroom lobby. Taste fresh seafood and savory cocktails in our new restaurant and outdoor terrace bar overlooking the harbor. We have everything you need for the perfect wedding. Set alone at the end of a wharf overlooking the harbor is The Pier Restaurant. With a marina next door, there won't be any shortage of beautiful yachts and boats while you enjoy your rehearsal dinner, wedding, or special event. Features large outside bar dockside, plenty of seating inside for formal affairs or outside amidst the cool ocean breezes. Either way, you can't go wrong with having your special wedding day at The Pier.